An inside look at the inspiration behind Robert Sonneman’s newest LED design. Torus, Robert Sonneman’s new pendant fixture of reflected LED illumination, is equally at home inside or out. Here is his inside look into this new lighting design, available exclusively at Lumens. What inspired the design of the Torus? Challenged to create a lighting volume that could illuminate the night outside or be equally effective indoors, I sought to resolve the form with minimal mass and the soft shape of an airfoil. Revolving the shape around a center axis, it formed a ring of reflected luminance through which air could pass. And the soft shape of the Torus geometry makes it appear to float in air. Torus, as its namesake implies, is the revolution of a conic circle-like form revolved around a center along the same plane. Can you tell us more about the manufacturing process? Starting as a large disc cut from a flat plane of aluminum sheet, the disc is spun at high speed around a form of the desired shape. Once spun out to its basic form, the interior and the outer excess material is trimmed away, leaving a ring in the exact profile intended. Polished and then painted on the exterior, it is oven-baked before its interior is sprayed with white reflective enamel. The Torus body is then fitted with banded integrated circuit boards with the LED diodes in place. This process brings together a traditional manufacturing method with the latest electronic technology designed for maximum efficiency of bounced LED illumination. Does it become more difficult to maintain the precision of the form as the scale increases? Scale generally makes it more challenging to sustain form and material consistency. As the material is spun at speed, it tends to thin out as it is worked towards its parameter. This process is managed with precision by increasing the thickness of the material as the size increases. What was important to you in designing Torus? A minimalist at heart, I always try to reduce complexity to achieve the design intent as simply as possible. To achieve the subtle shape that works efficiently as a luminaire, the shape of Torus was carefully designed for performance, enlisting the aid of our engineering team. The curve was diligently tested and refined to achieve luminous efficiency as Torus is scaled in size. This allows consistency in composition regardless of whether the installation includes multiple pendants of different sizes for large-scale projects or single pendants in intimate settings. Torus utilizes a thin-gauge cable that allows the fixtures to float in space with an open lightness. Do you view the cable as a necessity or part of the design narrative? Suspended from a light stainless-steel cable that is strong yet delicately inconspicuous allows the visual weight to be focused on the luminaire itself, with an effect of floating in air. Since the design intent was, from its inception, to be a minimal form through which air passes the feather-like suspension, the design achievement by the minimal supporting cables is very much consistent with the design narrative. Designed at Lumens’ request to accommodate interior and exterior applications, what additional compliance did the Torus require to meet necessary performance standards? Achieving the requirements of exterior installations required compliance with damp location standards, which involved shielding the LEDs, the connections and the integrated circuit boards from the moisture of outdoor environments. Torus performs in a damp environment under a shed roof or canopy that protects it from the direct pouring rain, for which it is not intended. Torus provides glare-free illumination. Does the convex nature of the design drive this feature? The convex shape is, in fact, concave from the point of view of the LED illumination. The shape shields the LEDs’ light source from line-of-sight visibility, and you see only the reflected light which, from the interior curve, is glare free. Torus is offered in the muted colorways of satin white, dove gray and satin black. What informed the color offerings? Tone and color affect perception and reinforce visual contour. The lighter-than-air appearance of the soft, cloudlike, curved shape is enhanced by the subtleness of muted colors. 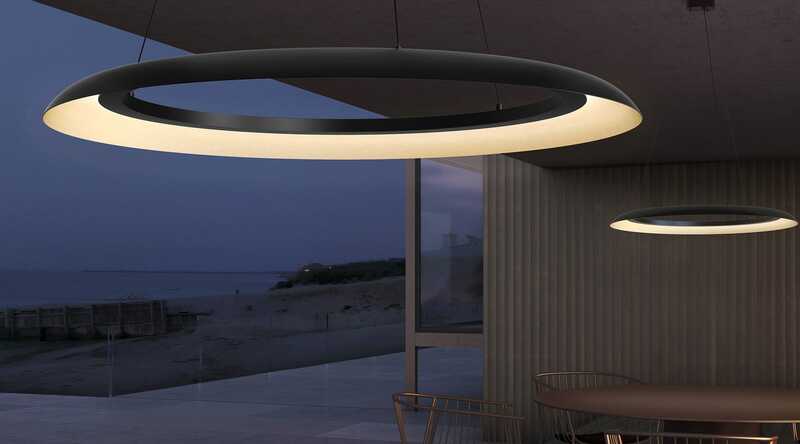 Alternately, the dramatically high contrast of the black exterior surface recedes from visibility, almost disappearing from the glow of the bright white illuminated interior surface of the ring. The satin white surface reduces color as a visual cue to perception, allowing focus on the subtleness of radiant glow from its minimal form. SONNEMAN continues to be a pioneer in LED lighting. What aspect of LED most excites you as a designer? I have come to understand that science and technology can be enablers of art and design. Technology-driven design has opened an entirely new universe of imagination and possibilities. Illumination from electronic technology, LEDs are transformational in creating the opportunity to rethink and reinvent the utility, scale, form factors, applications and sculptural opportunities of luminaries. The LED revolution re-energized and re-inspired me. Now, more than ever, I am excited to challenge the possibilities of what’s next. Each development opens a pathway to new insights that excites new opportunities in a growing process of discovery. Today, we are imagining a world of luminous energy with infinite possibilities of system integration and control. We continue to generate higher quality color and efficiency that enable us to minimize the volume and scale of luminaires while exponentially increasing performance. We can develop forms never before imagined and sculpt with highly controlled light itself.